HP Envy 2-in-1 Tablet/Laptop. This is a small, durable, simple old laptop good for watching tv while cooking or doing little portable tasks. a bit like a great big smartphone with a detachable keyboard. Fabulous HP Envy 2in1 Laptop/tablet in brushed silver. See photos. 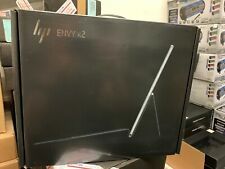 HP ENVY x2 12.3" 2 in 1 with 24 GB 4G Data, Silver ! Brand New! With Warranty! HP ENVY x2 12.3" 2 in 1 with 24 GB 4G Data, Silver ! With Warranty! HP ENVY x2 12.3" 2 in 1 with 24 GB 4G Data, Silver - Currys. Not sure whether you want a laptop or tablet?. Get the best of both worlds with the HP ENVY x2 12-e050na 12.3" 2 in 1. HP 4PJ86EA#ABU?. ALL Envy X2 12-G000na Tablet With Detachable Keyboard Core M. HP Envy x2 12-g000na - 12.3"- Core m3 7Y30 - 4 GB RAM - 128 GB SSD - UK. Product TypeTablet - with detachable keyboard. Input DeviceDetachable keyboard,stylus,imagepad. 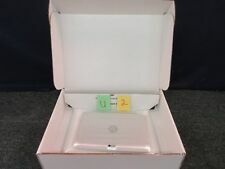 HP ENVY x2 Detachable 12g003nx. With high-performance specifications in a sleek, exceptionally handy design, this PC is prepared for anything from intense multitasking to video editing. With up to 15 hours Battery life, a rugged design and advanced connectivity, there is nothing that this hybrid can not handle. The HP ENVY x2 laptop is multifunctional and highly portable. If you need to take your work with you when venturing outside of the office, then the HP ENVY x2 with its great battery life will be a fine choice. Type: UltrabookBrand: HPProcessor: Intel Core i5 7th Gen.
P/N: 3SR51UAR#ABA. MPN: 3SR51UAR#ABA. ENVY x2 12-e091ms 12.3-in 4GB 128GB Adreno 540 Windows 10 S 2 in 1 Notebook. Manufacturer: HP Remarketing. HP ENVY x2. Power that takes you places. The HP ENVY x2 is proof that less is more. P/N: 3SG88UAR#ABA. MPN: 3SG88UAR#ABA. ENVY x2 12-e011nr 12.3-in 4GB 128GB Adreno 540 Windows 10 S 2 in 1 Notebook. Manufacturer: HP Remarketing. HP ENVY x2. Power that takes you places. The HP ENVY x2 is proof that less is more. HP ENVYNOTEBOOK X2 MOTHERBOARD WORKING PERFECT 100% TAKING OUT FOR A WORKING UNIT. Model number: HP TPN P104. For sale is broken HP ENVY x2 11-g001eo. Broken screen, no other tests have been made. HP Envy x2. 1x HP Envy x2. Sold as faulty for spares or repair, Has scratches on body. See photos! MINT condition. You should not use this information as self-diagnosis or for treating a health problem or disease. Der Akku der Station wird beim Systemstart als kritisch erkannt. (siehe Foto). OtherModel number: ENVY x2 Detachable 12-e091ms • Includes HP Digital Pen in natural silver and USB-C to USB-A dongle • Full-size island-style backlit keyboard. This warranty covers the unit for any manufacturer defects. HP ENVY X2 12-G018NR. Hard Drive 128GB PCIe® NVM™ M.2 SSD. With long-lasting battery life, durable construction, and advanced connectivity, there’s nothing this detachable PC can’t handle. Plus, get long-lasting battery life  of video playback, enhanced with wide-viewing angles and incredible detail. HP ENVY x2 Detachable 12-g003nx. Durch die High-Performance-Spezifikationen in einem schlanken, aussergewöhnlich handlichen Design ist dieser PC auf alles vorbereitet – von intensivem Multitasking bis hin zur Videobearbeitung. FOR SALE IS A NEW OPEN BOX HP ENVY X2 LAPTOP WITH DETACHABLE SCREEN. THE MODEL NUMBER IS ENVY X2 PC 11-G012NR. THE COLOR IS SILVER/PROCESSOR ATOM Z2760/WINDOWS 8/64GB STORAGE. YOU WILL GET EVERYTHING YOU SEE IN THE PICTURES. FOR SALE IS A USED HP ENVY X2 LAPTOP WITH DETACHABLE SCREEN. THE MODEL NUMBER IS ENVY X2 PC 11-G012NR. THE COLOR IS SILVER/PROCESSOR ATOM Z2760/WINDOWS 8/64GB STORAGE. YOU WILL GET THE LAPTOP AND POWER BRICK AS SHOWN. Processor Type: Snapdragon 835. Touchscreen: Yes. Power that takes you places. The HP ENVY x2 is proof that less is more. With its incredible battery life, durability, and connectivity-there's nothing this lightweight PC can't handle. This computer is brand new unopen and never out of the box. The box sealing tape is intact. It is not the refurbished type many people are selling. 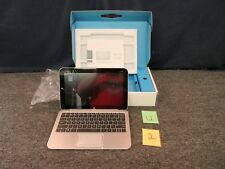 HP ENVY 12.3" x2 Detachable 12-e091ms 4GB RAM 128GB SSD. Condition is Brand New. Shipped with FedEx Ground or FedEx Home Delivery. Qualcomm Snapdragon 835 8-Core Processor 2.2GHz. Qualcomm Snapdragon X16 LTE Modem. 128GB Universal Flash Storage. HP ENVY x2 Detachable 12-e091ms (TOUCHSCREEN). 4GB LPDDR4x-3733 SDRAM (onboard). Finish: HP Keyboard and Case in Oxford Blue & HP Tablet in Natural Silver. ENVY X2 11-G080EL. tablet trasformabile 2 in 1. 3SR51UAR#ABA HP. MPN: 3SR51UAR#ABA. Touchscreen: Yes. Network & Communication. Total Number of USB Ports: 1. Our warehouse will select the most appropriate carrier when your order is processed. Bluetooth: Yes. CAPOT COUVERCLE DE L'ECRAN AVEC HAUT PARLEUR EN TRES BON ETAT. POUR PC CONVERTIBLE HP ENVY X 2. Visuelle : l ’objet est en très bon état physique ne présente aucun défaut particulier à signaler. Ordi-pas-cher ordi pour tous. FOR SALE IS A LIGHTLY USED VERY NICE CONDITION HP ENVY X2 LAPTOP WITH DETACHABLE SCREEN. THE MODEL NUMBER IS ENVY X2 PC 11-G012NR. THE COLOR IS SILVER/PROCESSOR ATOM Z2760/WINDOWS 8/64GB STORAGE. YOU WILL GET EVERYTHING YOU SEE IN THE PICTURES. 3SG88UAR#ABA HP. MPN: 3SG88UAR#ABA. Touchscreen: Yes. Network & Communication. Display Screen Type: LCD. Total Number of USB Ports: 1. Our warehouse will select the most appropriate carrier when your order is processed.